Are We Hot Are We Cool--Where and What Are We? There are so many new terms on the climate and opinions about where our planet is headed. We see changes happening around us everyday in natural disasters and extreme weather, that it makes us wonder what is going on. Here is some basic information to help you understand what it all means. When the average temperature of the earth's atmosphere and oceans increases too much it is called Global Warming (as opposed to "global cooling" during the ice age) . Our planet is HOT, but you want to live on a cool planet, dont you? Oh, but not too cool! Say NO to an ICE AGE!. Whats the Equation for a HOT Planet? Earthman say's "I don't like being HOT" Keep me COOL! Whats the Solution for a COOLER Planet? What Is The Difference Between Global Warming, Greenhouse Effect And Sublime Climate Change? "Greenhouse effect" is the effect of certain gasses that trap heat in the atmosphere and raise the temperature of the planet. 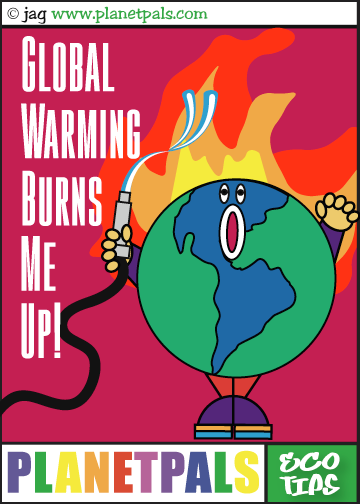 "Global warming" is the rise in temperature caused by the greenhouse effect. "Sublime climate change" is the change in the climate caused by global warming. Is Sublime Climate Change the Same as Climate Change? Sublime means "exalted" . So, that's going higher. Climate change alone means the changing climate, either hot or cold. Global Warming is a Global Warning! In recent decades, scientists show that the temperature has changed on earth at an alarming rate! Many scientists think that our actions here on earth are the cause for global warming. The gasses our cars and trucks emit into the atmosphere, air conditioning and heating our homes and offices and other abuses of natural resources contribute to climate change. If we continue to abuse earth and overuse our resources we don't know how much climate change can be expected in the future. But , we know we must do something to try and stop this global trend! Global Warming is Not just a Lot of Hot Air! This increase in global temperatures can cause other changes, such as a rise in sea level and major changes in precipitation. These changes can cause extreme weather events, such as floods, droughts, heat waves, hurricanes, and tornados. Other consequences include changes in our ozone layer, farming crops, melting glaciers, extinction of plant and animal species and even decease. This will eventually be a threat to all of us! 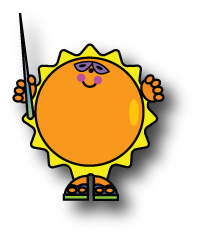 Sunny Ray Says--Cool is cool-but too cool is an Ice Age! Global Cooling is not a new concept. It means that the earth's surface s becoming cooler due to Glaciating and solar activity. Solar activity and climate through the ages has always gone up and down between high and low during the past 10,000 years. In fact the Sun spent about 17 per cent of those 10,000 years in a sleeping mode, with a cooling Earth the result. *Glaciating: A glacier is a natural accumulation of land ice showing movement at some time. Many times during Earth's history, great ice sheets waxed and waned over the surface. What caused these periods of glaciating is still not fully understood and no single reason. Do they think the EARTH is going to be COOL? Some scientists think that GLOBAL WARMING IS OVER and GLOBAL COOLING may be taking it's place. Some think that the predictions for the future are unreliable. So, Are We Cooling or Warming? So is there Global Cooling now? The jury is out. Does Climate Change Means We Will Be Changing Our Clothes? Whether it is Global Cooling or Global Warming--it all adds up to change--Climate change. It effects the kind of weather we have where we live. So, yes--if it gets warmer we will have to wear lighter clothing and if cooler we will wear heavier clothing and add layers. All in all, try not too waste energy! Follow our eco tips to save on energy consumption, whether it be air conditioning or heat. Today, we have become more aware about earth's issues, but we need to act! Corporations need to get better at conservation as they are the big problem. Even as a single person we need to improve our actions. Every little thing we do as people can help earth. Whether we have global cooling or warming we still need to thin about the OZONE. How many times do you see a building, a bus,a truck or a car emitting too much black smoke? What happens when a developer puts up a building in place of trees and plants that make oxygen? What do you do at home? Do you burn your leaves? Do you use too much air conditioning or heat when you could just wear different clothes? Do you throw away too much trash that takes the place of plants? Do you ride around too much in your car and use unnecessary gas?